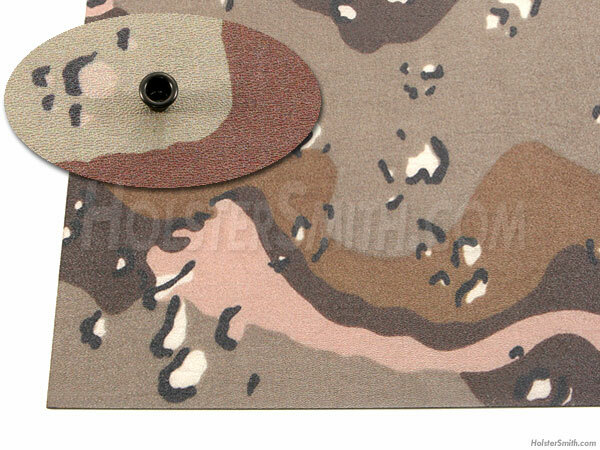 This product is cell/smooth textured .080 gauge Kazakhstan Desert Camo KYDEX®. Many people refer to it as "KazaCam". It is officially Kazakhstan Desert Camo, but it is prized by fall/winter season hunters around the world, as it has excellent blending quality for fall and winter seasonal terrains where snow is not the predominant ground cover. This 6-color pattern is an exclusive product and is specifically created for thermoform molding. Kazakhstan Desert Camo is made from KYDEX® cell/smooth textured sheeting and features the design on the cell-side surface. The pattern is not a film on the surface of the material, but is made from a proprietary process, exclusively developed by our design team. Our specially produced pattern does not fade or crack when formed and is highly durable under normal use. The base finish of 6-color Kazakhstan Desert Camo KYDEX® sheet is semi-gloss and can be bead-blasted if matte finish is desired.